An operator’s certificate means you can drive a forklift truck in a closed yard with no public access, or a warehouse. A closed yard is a yard with a gate and signage warning that people must not enter. While the gate doesn’t have to be closed all the time, it’s important that it’s clear to other people that it’s an area with forklift traffic and is out-of-bounds to the general public. If you want to drive a forklift on the road in a company car park, an internal road, driveway or footpath then you need an F endorsement (although, it’s likely the F endorsement will be eliminated in the near future). It’s not necessary to do NZQA unit standards, but if you want to they are 10851 (operate a powered industrial lift truck fitted with forks [forklift]), 10852 (operate a powered industrial lift truck fitted with attachments on a worksite – attachments are hydraulic), 18409 (use a forklift-mounted safety platform in the workplace) and 18496 (demonstrate knowledge and skills for driving a forklift on a road – F endorsement). 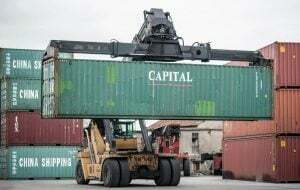 You don’t need to have a full class 1 car licence for 10851 or 10852, but you must have a full car licence for 18496 for forklifts up to 18,000kg, and a full class 2 heavy vehicle licence for driving a forklift of more than 18,000kg. More information on licence requirements is available here. Your first step is to get access to the theory so you can learn the safe practices required in the Approve Code of Practice. This is all covered in our forklift course. 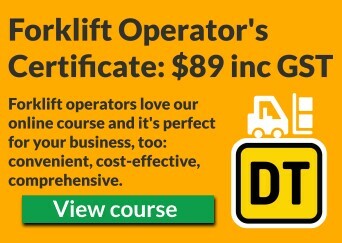 Here’s the overview video for the forklift operator’s course. Undergo in-house instruction and assessment at your employer by a suitably qualified individual. The Health and Safety at Work Act 2015 clause 226(4) allows a business (a ‘PCBU’) to choose alternative ways of complying with the Approved Code of Practice, as long as the health and safety outcomes meet or exceed those stated in the Code. This means that a suitably experienced or qualified forklift operator or supervisor in a company can induct, train and assess a forklift operator as long as they follow (at minimum) the practical guide supplied. WorkSafe produces a document relating to training, instruction and supervision in the workplace that states that a business can use an internal or external trainer. The F endorsement theory can be done online here. Once you have completed the theory you must book in with an approved forklift assessor so that you can do the practical and theory assessments. They will give you a certificate when you successfully complete it. To get your F endorsement on your licence you will need to provide a certificate to NZTA showing that you’ve successfully completed an approved course. You must wait until you receive your driver licence back with your endorsement before you can use a forklift on the road. You will need to fill out an application form, present evidence of your identity, prove your eyesight meets the required standard, provide a medical certificate, pay the application fee and present your certificate from the approved instructor. Forms can be downloaded here. How long are forklift qualifications valid for? An operator’s certificate is usually valid for three years – this is the recommendation in the Approved Code of Practice – but a company can decide to refresh the certificate more or less frequently depending on other training initiatives in place. An F endorsement, once granted, remains on a driver licence as long as the licence is valid. It can be renewed for a small fee when the licence is renewed. You do not need to take another F endorsement course. How much experience do you have? Forklifts are very dangerous. 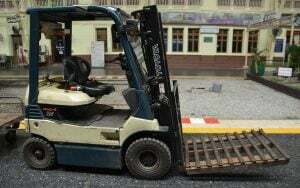 If you have never driven a forklift then you will need to take a beginner course. These usually take 1-2 days. If you have some experience then you can take a shorter course that usually lasts for 4-8 hours. Check with the instructor what they recommend. Do you need the instructor to come to your workplace, or will you go to a training centre? Some instructors offer both options, some offer only one option. Do you need your forklift instructor to conduct a health and safety audit? Forklift instructors frequently offer workplace health and safety audits you can take advantage of. Do you need any specialised forklift training? Specialised forklift training can be supplied if you already have an F endorsement, but have obtained a new type of forklift with unfamiliar attachments. Some vehicles like reach stackers which are frequently seen operating in ports also require a forklift licence. Do you need a multi-lingual instructor? Some instructors speak languages other than English. Is the vehicle you want to drive actually a forklift? There are some other vehicles like reach stackers (shown in the image) which you will need a forklift licence for. However, some vehicles might come under wheels, rollers and tracks licence endorsements. Check with an instructor. How do you find an instructor? You can find driving instructors that offer forklift courses by looking in our driving instructor directory. Instructors commonly combine 10851 and 18496 into a bundle that is cheaper than doing the two separately. Ask around for recommendations – a good forklift instructor is very valuable, while a bad instructor won’t provide you with any value and could either teach you unsafe techniques or put you off driving a forklift. Follow the instructions for booking a practical assessment and training. ‹ What type of drivers are most at risk of accidents?